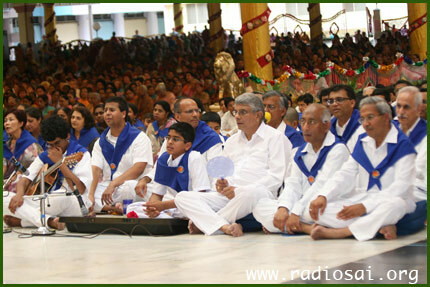 The Guru Poornima of July 2011 witnessed the historic event of the unveiling of the Maha Samadhi of Bhagawan Baba. Thousands had gathered in the sacred precincts of Sai Kulwant Hall to be present on this sublime occasion and soak in the divine energy that pervades this entire township and beyond. The crowd in fact was no lesser than in the earlier years. 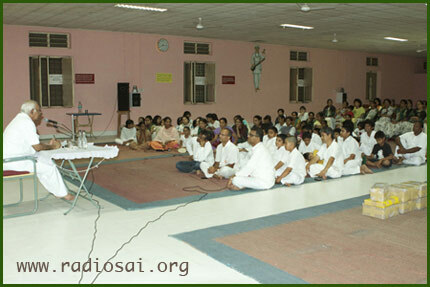 And like always Prasanthi Nilayam witnessed the homecoming of many a eager spiritual aspirants from overseas too. 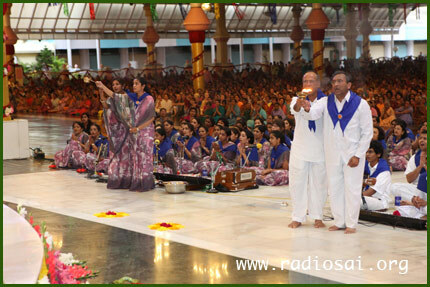 The Guru Poornima festivities continued even after July 16 with many groups being blessed with the opportunity of performing for Bhagawan in the Sai Kulwant hall. The Glendale-Arcadia Sadhana Group and the Glendale Balavikas from Southern California were one such. This 121 strong pilgrim group from the US had the chance to offer a musical programme at the divine lotus feet on July 22.
offering their musical programme to Bhagawan on the evening of July 22, 2011. A couple of days after this, on the request of the group, Prof. Venkatraman addressed them on the evening of July 25. The presence of large number of children in this group (more than 40%) prompted Prof. Venkatraman to turn the session into an interactive one, though in the latter half of this meeting, he did share with them certain salient aspects of Swami's life and mission. During the interaction session, the children asked many questions like “Why is there violence in the world today?”, “How to see the Atma in all?”, “How to feel Swami's Presence in the current times?” and so on. Some first-timers and young parents too sought similar clarifications. Since this session turned out to be pretty interesting and profound we now wish to make this available for all because the answers that Prof. Venkataraman offered may well help to clarify such doubts in the minds of many others – young and old – from all around the globe. 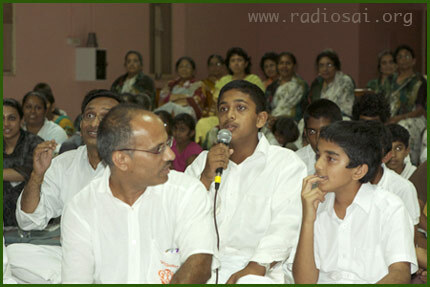 So please do listen to the recording of this interactive session which was held in the Conference Hall on July 25, 2011. We will also make available the transcript of this session at the earliest possible.